To be clear, this recipe does not include Velveeta as one can not use the words “real food” and “velveeta” in the same recipe and be telling the truth. In addition, this is not a recipe for Velveeta. I refuse to experiment to come up with a way to make a cheese product that has a shelf life. But. As many of you know, I have a ridiculous love for the completely nasty and absolutely delicious Velveeta Rotel Dip that I grew up on as a kid. You may remember that I wrote a love letter to Velveeta a few years ago and bid her farewell as I created a tasty dip to replace her. Sure enough, we make that dip frequently at our house as it is super easy, all real food, and absolutely yummy. But. That recipe, as good as it is, is still not the same as the Velveeta Rotel Dip I crave. That is why (and I’m not proud of this) sometimes I put a $6 log of boxed cheese product (otherwise known as Velveeta) into my cart along with 2 cans of Rotel and I bring it home and I melt it together and I eat it even though it is terribly terrible and truthfully it doesn’t even taste as good to me as it used to because of that whole real food thing I’m into now which has made all bad foods taste like chemicals on a tortilla chip. Problem? I don’t have a problem. Okay fine. Whatever. I have a problem. And also? When did fake cheese become so expensive? You’d think that would deter me from buying it. But as I said, I have a problem. A support group was out of the question because it is my understanding that they don’t serve chip dip at those meetings. So here we are again, back in the kitchen for another attempt at a real food version of my beloved dip. You guys. I think I nailed it this time. And I mean that with all the humility and sweetness possible, but hey guess what? I just made the best chip dip ever!!! We must make a cheese sauce for this to work. This requires butter and corn starch and actual cheese. Relax. It’s not as hard as it sounds. We must use actual Rotel or an off brand of “diced tomatoes and green chilies. Salsa isn’t the same. Thankfully, Rotel is still a real food – read the ingredient label and rejoice. Note: My wonderful grass-fed beef produces the perfect amount of fat so I never have to drain off grease. In order to make a sauce, one must have fat or grease to work with. That’s why my recipe includes butter. Depending on what meat you have, I recommend either skipping the butter (if your meat has some grease to work with) or draining the grease and adding the butter or using your grease with some butter. Just so you have about 4 Tablespoons of fat to work with, you’re golden. Add cream, continuing to stir as the mixture thickens. (This all happens quickly in my experience.) Stir in Rotel, heating for about 2 more minutes. If you don’t remove your sauce before adding cheese, your cheese will end up funky and not smooth and creamy. You’ve been warned, so don’t add your cheese while your pot is still on the stove, then email me and ask why your cheese got funky. Not that anyone would ever do that. If you need me, I’ll be in the kitchen eating another bowl of my homemade not velveeta but way better than velveeta because it’s real food Chip Dip. Who wants to come join me? I need to know who loves this dip as much as me. Admit it. Join my support group – the one where there IS CHIP DIP AT THE MEETINGS because my support group meetings rock and we support one another by eating dip. 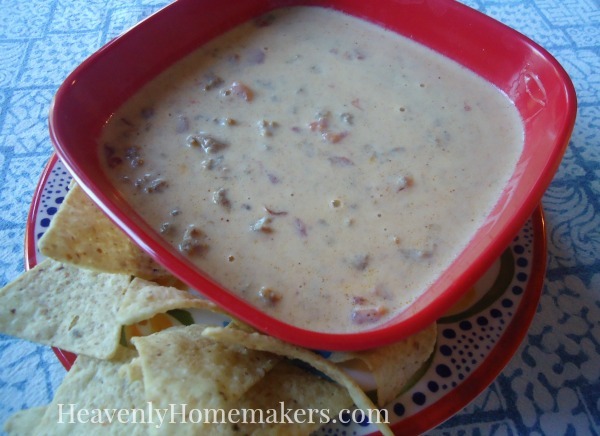 It’s recipes like this Real Food Velveeta and Rotel that makes Simple Meals what it is. It offers you huge money and time savings. Not to mention you don’t have to think as hard every week about what to cook and what to buy. I have followed and loved your blog for a few years now. I hardly leave comments but I wanted to write one on this post. Thank you for being so real with your love of childhood memory filled processed food. I love velveeta macaroni and cheese. I grew up on it. Along with Kraft mac n cheese, Doritos, spaghetti-o’s, anything off the Schwann truck, and the list goes on. I’m always amazed that after eating real food for the last 5 years I still crave these foods because of the history and memory attached to them. I always feel so guilty when I read food blogs that berate you for still craving those foods. I do. And some times I give in and I buy a box of Velveeta mac n cheese. And it is disgusting but my heart loves it. OK, I’m sure my physical heart is screaming “No! No processed yuckness that only slows me down,” but my heart that holds the memory of my mom making a box of it with Schwann chicken tenders and a can of corn loves it. Anyway I think i digressed there. Thank you for being real about food and how you feed your family. Thank you for taking these recipes and converting them into real food for all of us to enjoy. Have a great week. Happy 4th of July. I was going to comment along the same lines. I keep Ramen noodles around and eat one when I’m recovering from the flu. Because that’s what I always did as a kid. And I still keep Kraft mac n “cheese” around to eat when I have a cold. Because that’s what I did as a kid. Logically I know it makes no sense to eat pure garbage when my body is in recovery but it’s just a holdover from my childhood. Since I luckily don’t get sick much I’m sure I’ll live. And yes – it is amazing how much I’ve learned to really taste food and how my mouth can identify on its own when food isn’t real! I just tried making my own nacho cheese dip the other day (by kiddos request) and mine got almost a grainy texture to it when the cheese was all melted in. The flavor was good but the texture was def not what I would call smooth and creamy. I was disappointed because I love that awful unhealthy canned nacho cheese that IS smooth and creamy. After seeing your note on this post I’m thinking my problem may have been the fact that the recipe I was using just said to melt the cheese in while it was still cooking. I look forward to trying it again using your tip and also to trying this recipe. It sounds delish! I have read that using pre-shredded cheese could result in a texture issue. Apparently some shredded cheeses are coated in flour to keep it from clumping in the bag. That means that we are adding extra flour to our recipes and at the wrong time. It will cause the sauce to be funky. I’m to cheap to spring for pre-shredded so I cannot verify this, but that is one reason I have heard if a cheese sauce goes wrong. Oooh, I’m trying this for my Sunday night snack. I am going to use sausage instead of hamburger. Your other chip dip that is similar is a staple in our house. Looking forward to a new recipe in the Not Velveeta arsenal. Never can be too many dips!! You may have saved my marriage. My husband does not like “home cooking” and says that he can make a meal off of snack foods. He does not buy into the real food movement because he would have to give up the comfort food, i.e. the loves of his life. The fact that your version has meat (I’ve never made that dip with meat before) got me to thinking, “Maybe I could totally make this into a meal with a few healthy sides!” You don’t know the excitement this brings to someone who struggles with cooking and meal planning. How you ever written a post about making meals out of snack foods or foods that feel snackie? Sounds wonderful! Just wondering, why cornstarch and not flour? I do – on occasion – plop that box into my cart too, and feel terrible about it, but my guys (and especially my husband) adores that dip. I’m so happy to see this! A million thanks for doing all that experimenting for us. ???? Is there something that could be substituted for corn starch? I used it with arrowroot powder. Worksed amazingly. Now waiting on the husband and teenage sons approval! Just finished making this and turned it into my version of homemade “Nachos Bell Grande” :) It was a HUGE hit!! My normally picky, pregnant daughter even loved it, as did her husband!! I put blue corn tortilla chips on the plate, several “scoops” of the dip, topped with shredded lettuce, diced tomatoes, homemade guacamole, and sour cream. Heaven on a plate!! Thank you so much for sharing this recipe!!!!!! So glad to hear that you tried it already and loved it! Americas test kitchen diy cookbook has a recipe for homemade velveeta. Its sooooo good its scary! And real food! Thank you so much for posting this recipe. This is also one of my favorite dips and although I grew up on the yellow box cheese I have not purchased it myself since having my own family. I can’t wait to make this dip. It looks so delicious. I love your blog and your recipes. I truly get excited when your email pops up in my inbox. I am always inspired by your Bible verses, thankfulness to God, and recipes. Keep them coming and thanks for lifting my spirits when I so often need it. Blessings to you and your family!!! I must admit, Laura, that I do not struggle with loving, but not wanting to love, Velveeta. I’ve actually never cared for it, but this dip looks delicious! Thanks so much for creating and sharing this recipe. Pinning! This looks amazing. I am one of those wackos that doesn’t crave all the stuff I gave up. I think my OCD keeps me in check. That little voice inside my head that says, “yuck, not food; poison.” Anyhow, I can’t wait to try this, without meat. My son loves your recipe for homemade ranch. It’s the only one that passed his picky palate, and since he is allergic to soy, he can now have all the salad he wants! I have been making a real food version of this for years by using REAL American cheese, 1 pound of rinsed ground beef, and Rotel. I simply dump the undrained Rotel in a pan and add about 1/2 to 3/4 pound of American cheese, turn the burner on low, and stir occasionally so it does not burn. Mix in the ground beef when the cheese is melted. Simply add water if it becomes too thick. My family LOVE it!! Do you know how this does after you make it if you put it in the crock pot on warm or low? I would like to make it for a party dip. I just made it, and it is FABULOUS! I haven’t tried it (I need to!) but I think it should work well! I know this comment is old, but in case someone else has the same question — I do put mine into a small crock right away and keep it on low. Good to know. Thinking of bringing it to small group. Thanks! Made it for the first time tonight on a whim. Love it!! Had some leftover grilled zucchini, peppers, & onions. Added them while the meat browned. Extra veggies and no one will know. I just had to comment to let you and your readers know that this dip is super amazing. It is absolutely delicious! Thanks for sharing your recipes! God Bless!!! I’ll be making this for superbowl! Thanks! Looks AMAZING!!!! I am type 2 diabetic and have been eating lower carbs and sugars and was wondering if you had any ideas for chips that would be healthy to eat? I just made this and it’s super delicious but it’s too thin. What can I do to thicken it up? Has anyone tried to freeze this? If I freeze this what is the best method for heating it up? Should I defrost overnight in the fridge? Thanks! I’ve made this and it’s super delicious. We had leftovers and when I heated it back up, it was very thin. Do you have this problem? Sometimes the ingredients separate sometimes once chilled and reheated. I try to whisk them back together but that doesn’t always work! I just finished making this and it is wonderful!! I used a bit less water and cream than the recipe called for so that it would hopefully end up thicker — it worked! Thank you for the great recipe! This is AMAZING!!! It’s so much creamier and even tastier (not to mention cheaper) than the $6 block! Haha, it’s a definite hit, especially when you just want to throw something together. I’d say you definitely succeeded! Thank you for making and posting this delish recipe! Hi Laura! Just made this for our Mother’s Day lunch! I’ve been craving this dip for a while! I substituted arrowrot starch for cornstarch and it did the job. Thanks for this real food recipe!